[161 Pages Report] The blockchain in manufacturing market is expected to be worth USD 30.0 million by 2020 and USD 566.2 million by 2025, growing at a CAGR of 80.0% during the forecast period.The blockchain in manufacturing market is likely to witness rapid growth in the coming years due to increased demand from energy & power and industrial sectors. Increasing global energy demand encourages companies operating in the energy & power industry to adopt blockchain solutions that can help them enhance production with minimum maintenance and reduced downtime. Companies are moving toward adopting blockchain and IoT as these technologies can enable real-time data analyses, detect movement of high value equipment, easy deployment of solutions, and monitoring customer purchase behavior. These solutions also provide product manufacturing and leasing companies business insights to assess the performance of their equipment and compare product usage across various regions. Moreover, real-time analytics tools help aligning to dynamically changing requirements in the industrial equipment ecosystem. As of 2018, key industry players, such as IBM Corporation (US) and Microsoft Corporation (US) have introduced blockchain services and are striving to push their adoption in the market. However, by 2020–2025 many other large players, as well as startups, would also offers products and solutions in this market. The trial and testing phase considered for the study is 2016–2019; estimated year for the commercialization of blockchain in manufacturing is 2020 and the forecast period is from 2020 to 2025. The objective of the report is to provide a detailed analysis of the blockchain in manufacturing market by application, end use, and geography. The report provides detailed information regarding the major factors influencing the growth of the blockchain in manufacturing market. The research methodology used to estimate and forecast the blockchain in manufacturing market begins with obtaining data through secondary research such as corporate filings (such as annual reports, investor presentations, and financial statements); The Association for Manufacturing Excellence, The Association For Manufacturing Technology (AMT), R3CEV Consortium, Hyperledger Foundation, Chamber of Digital Commerce, The World Economic Forum; white papers; journals and certified publications related to blockchain technology; articles from recognized authors; gold and silver standard websites; directories; and databases. Key offerings of blockchain in manufacturing solution providers have also been taken into consideration to determine the market segmentation. Bottom-up procedure has been employed to arrive at the overall size of the blockchain in manufacturing market from the revenues of key players. After arriving at the overall market size, the total market has been split into several segments and subsegments, which then has been verified through primary research by conducting extensive interviews with officials holding key positions in the industry, such as CEOs, VPs, directors, and executives. Market breakdown and data triangulation procedures have been employed to complete the overall market engineering process and arrive at exact statistics for all segments and subsegments. The breakdown of the profiles of primaries has been depicted in the following figure. What new application areas in manufacturing are blockchain companies exploring? This research report categorizes the overall blockchain in manufacturing market based on application, end use, and geography. 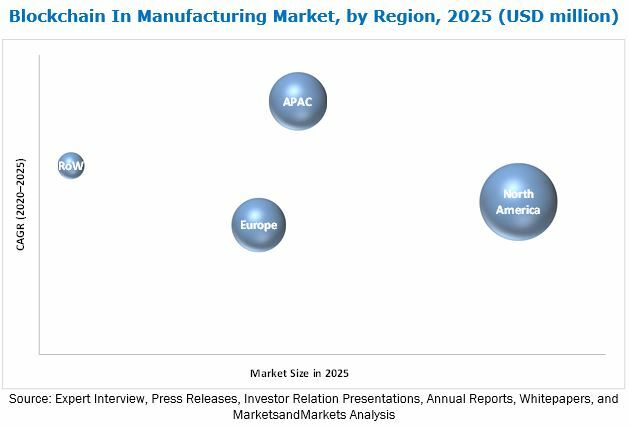 The blockchain in manufacturing market is expected to be worth USD 30.0 million by 2020 and USD 566.2 million by 2025, growing at a CAGR of 80.0% from 2020 to 2025. 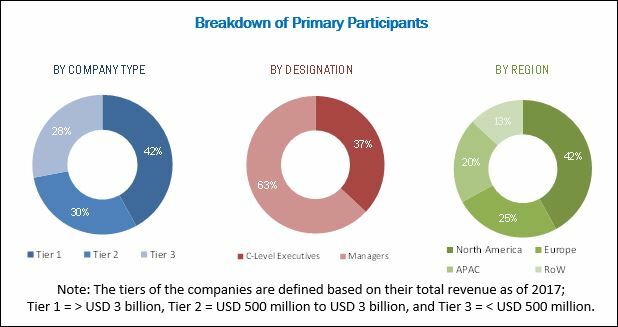 Some of the major growth drivers for this market would be convergence of operational technology (OT) and information technology (IT); sudden rise in global blockchain-related patent filings; substantial upsurge in venture capital funding; demand for real-time data analyses, predictive maintenance, and visibility into business processes; and use of disruptive technologies such as AI, IOT, and blockchain in the manufacturing industry. Among all applications, logistics and supply chain management applications are expected to account for the largest market share as well as the highest CAGR during the forecast period. Blockchain can support supply chain management by offering users reliable data management and visualization capabilities. Technology enabled supply chain can provide an intelligent, interconnected network that binds together multiple tiers of suppliers, manufacturers, service providers, distributors, and customers distributed across the globe; technologies like blockchain, AI, and IoT are helping traditional methods of supply chain management, product tracking, and inventory management evolve to handle present day complexities. For example, nearly 90% of goods in global trade annually are handled by the ocean shipping industry blockchain solutions would help manage and track the documents of tens of millions of shipping containers across the world by digitizing supply chains. 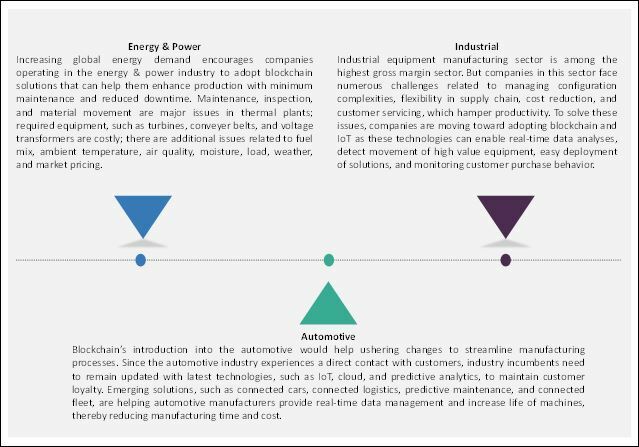 Energy & power and industrial sectors are expected to account for major shares of the overall blockchain in manufacturing market during the forecast period. Maintenance, inspection, fuel mix, ambient temperature, air quality, and material movement are major issues in the energy & power sector. Using blockchain along with AI and IoT can help solve such issues and predict possible issues that may arise in future. These technologies in energy plants comprise deep physics insights, engineering design knowledge, and new inspection technologies that provide a complete solution for predictive maintenance and machinery inspections. Grid Singularity is creating an open (permissioned) Internet-based decentralized energy data exchange platform. The ecosystem would enable forecasting for grid balancing (smart grid management); facilitate investment, trade of green certificates/certificates of origin, and eventually energy trade validation. Innovators from institutions such as Massachusetts Institute of Technology (US) and Cornell University (US) and companies such as IBM and Intel are trying to develop green blockchain innovations to address demand for blockchain that streamlines transactions of all sorts. Logistics and supply chain management is vital for a lot of companies, particularly ones in the manufacturing industry. The objective of any smart supply chain management system is to reduce inventory costs to the minimum possible limit without affecting normal operations of an organization. Supply chain management covers everything from product development, sourcing, production, and logistics to coordination between these activities. Blockchain can support supply chain management by offering users reliable data management and visualization capabilities. Technology enabled supply chain can provide an intelligent, interconnected network that binds together multiple tiers of suppliers, manufacturers, service providers, distributors, and customers distributed across the globe; technologies like blockchain, AI, and IoT are helping traditional methods of supply chain management, product tracking, and inventory management evolve to handle present day complexities. The supply chain ecosystem includes various components, such as legal, insurance, settlement, transport management, route planning, normative compliance, and fleet management, which require intermediaries. But with blockchain, intermediaries can be taken out of the equation to streamline the flow of supply chain operations; it also allows all transaction data across networks to be synchronized, enabling participants validate each other’s work. However, blockchain’s major advantage continues to be accountability and visibility: even with transaction volumes and respective data significantly high, each transaction can be accurately backtracked to its point of origin. In 2017, IBM and Maersk tested the application of blockchain in logistics. In a proof-of-concept, the 2 companies demonstrated how blockchain can be used to track on-transit containers, and how supply chain stakeholders can benefit from accessing relevant, actionable information. In the future, other players like shippers, freight forwarders, ocean carriers, ports, and customs authorities are going to be included in the platform. By reducing paperwork, providing important information more rapidly, and preventing shipping fraud, IBM and Maersk hope to reduce logistics costs drastically. Another start-up working on similar lines is Everledger that uses blockchain to register diamonds’ transaction history and ownership. In the future, the start-up wants to extend its solution’s applications to other goods. Quality governance and quality decision-making are important areas that need to be effectively addressed to build a sustainable quality culture within a firm. Blockchain can transform these functions by holding and providing data on provenance and quality, which are easily accessible to all parties. This would augment quality control and compliance by enabling granular and quick identification of sources of quality issues, helping companies reduce overall operational costs. Business process optimization offers mechanisms to monitor, manage, and improve organizational workflows. This provides companies an ideal opportunity to evaluate whether or not existing internal controls embedded in their business processes are performing as intended, and optimize a process by using previous recorded data and real-time data. Process optimization analyzes every critical step of a process and provides optimum solutions based on demand, error, maintenance, and consumption forecasts. In addition, it also enables companies to build connected applications (for equipment, processes, and systems) within their intranet. The emergence of distributed and decentralized ledger technologies and the Internet of things (IoT) could be helpful in bolstering business process optimization tasks. Blockchain enables implementing collaborative business processes involving untrusted parties without needing a central authority: a process model comprising tasks performed by multiple parties can be coordinated via smart contracts operating on the blockchain. Will the suppliers continue to explore new avenues for blockchain in manufacturing? What are the upcoming use cases for blockchain in manufacturing? Key restraining factors for the market’s growth are uncertain regulatory landscape and absence of common set of standards. Lack of awareness about blockchain’s potential among manufacturers is as a major challenge for the growth of the market. Some of the major companies operating in the blockchain in manufacturing market are NVIDIA Corporation (US), XAIN AG (Germany), CargoX (Slovenia), RIDDLE&CODE GMBH (Austria), Chronicled (US), LO3 Energy (US), Electron (UK), Filament (US), Grid Singularity (Germany), Shipchain (US), Microsoft Corporation (US), Advanced Micro Devices, Inc. (US), International Business Machines Corporation (US), Intel Corporation (US), Oracle Corporation (US), Factom (US), BigchainDB GmbH (Germany), Blockchain Foundry Inc. (Canada), Wipro Ltd. (India), Amazon.com, Inc. (US), Syncron International AB (Sweden), Electron (UK), ChromaWay AB (Sweden), Project Provenance Ltd (UK), Everledger Ltd. (UK), Supercomputing Systems AG (Switzerland), Storj Labs Inc. (US), and Cloud Technology Partners, Inc. (US).